A small statuette of a tentacle-headed bat-winged ancient god that should be familiar to fans of H.P. Lovecraft cannot be destroyed, and so spawns a quest to deepest darkest Africa, in the tradition of Indiana Jones and Lara Croft. Though other homages to the American horror writer H.P. Lovecraft are there, the swashbuckling heroine in this adventure comedy will appeal to more than just the “Geek Theater Company” audience it was aiming for. The cast, consisting of Jennifer Crooks Meredith Armstrong, Curtis Eastwood, Cole Hornady, and Cody Smith mesh very well together, and manage to keep their rather British accents and dry wit despite the ancient gods that besiege them. All of the actors have their moment to shine in this entertaining story. Though the set is practically non-existent, the combination of beautiful costumes (designed by Julia Evanovich) and special effects (Amanda K. Pitsch, Zanna Paulson, and Patrick Mulligan) bring the parlors, ships, trains, and veldts in this production to life. This was the very first production by The Rogues Gallery, a company that got its start at the 2010 Seattle PAX convention with the playwright Cameron McNary’s first play, Of Dice and Men. 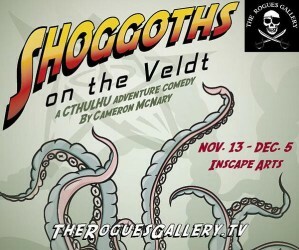 They are off to a good start with Shoggoths on the Veldt’s humorous, and refreshingly female adventurer.